Here is a photo of our little girls face! I know I'm partial, but she beautiful right?! I think she kinda looks like her brother too. I can't wait to meet her in person in 10 weeks!! 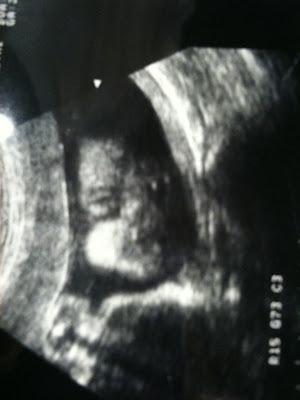 We had our 3rd ultrasound last week to see if the placenta had moved out of the way or not. The doctor told us it has moved enough to not do a C-section. It's still half blocking the birth canal but the more my uterus grows, the more it will get out of the way. (or that's what they are hoping for anyway). I'm sure it will all be fine! I just can't wait to meet her! Hurry up little bean!! Yes, it will be fine. That's such a great picture- she's so cute! A blog after my own heart! I'm a new follower. Congrats on your baby girl, I had my princess 3 months ago..nothing like shopping for a baby girl! !